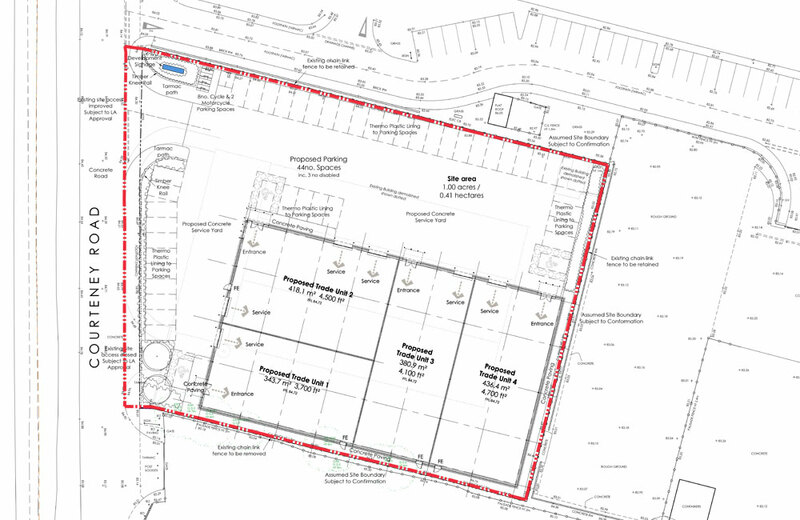 Detailed planning permission has been obtained for a trade park extending to 17,000 sqft arranged in four units. The site is located close to Gillingham Business & Retail Parks, adjacent to Jewson and KFC with Tesco within walking distance. This is a Tarncourt Ambit Properties scheme. Units from 3,700 sqft to 17,000 sqft. To Let on terms to be agreed. Four trade units totalling 17,000 sqft with shared use of 44 car parking spaces and service area. The units will be completed to shell specification although at this stage specific requirements can be incorporated. Eaves height will be circa 6m. Planning permission allows for B2 & B8 (with showroom) uses. The scheme fronts Courteney Road running parallel with Hoath Road (A278) linking the A2 to the M2, south east of Gillingham town centre. Adjacent occupiers include Jewson, KFC and C&A Plastics, although the area is dominanted by a Tesco Extra which is within walking distance. Gillingham Business and Retail Parks are on the opposite side of the Tesco roundabout.